The double-decker bus is an icon to the sightseeing industry. 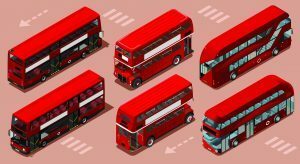 While they are used all over the world, the most famous is the bright red buses in London. But how exactly did this bus become the tourist bucket list item it is today? The first double-decker was actually a two-level horse-drawn carriage pioneered by a man named Stanislas Baudry. Later, inspired by Baudry’s idea (and his success), an English gentleman known as George Shillibeer brought the ‘omnibus’ to London. Costing originally 1 shilling to ride, Shillibeer’s bus could hold up to 22 people. In the 1920s, the first engine-powered version of the double-decker bus made its debut in London society. With a growing population, there was a desperate need for more buses, sparking competition amongst the many companies in the city. By the mid-1920s there were about 20 different companies with buses driving all over the city. The largest of these businesses, The London General Omnibus Company (LGOC), sought to differentiate from their competition and painted their buses bright red. At the time, I doubt anyone could have predicted the historical significance of choosing that one colour. In the 1930s the LGOC, like many other companies, merged together to became part of the collective London Passenger Transport Board. In the photo below you can see some of the different bus designs used over the years. Demand kept up until the 1950s when the most familiar model of the double deckers emerged. The ‘Routemaster,’ was first constructed in 1956. This version had an open rear door entrance, which was quickly removed since people thought they could jump on and off while the bus was moving. The main reason for their continued popularity was because the single-level buses simply couldn’t hold enough people, and the longer accordion version couldn’t handle London’s narrow streets. People also liked the viewing capacity and having open tops. 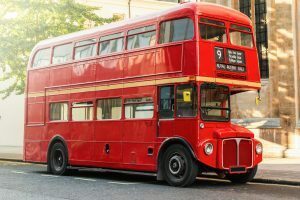 Even though the underground Tube has become many locals’ preferred method of transport, you’ll still see plenty of double deckers around London. Other cities also heavily feature them, such as Hong-Kong, Rome, Paris etc. Who knows, maybe Vancouver will soon have its own double-decker buses driving along the city’s streets. 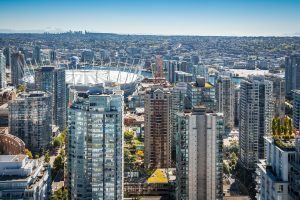 For any BC readers, here’s a fun fact for you: did you know that the first North American city to integrate a double-decker bus into their public transit system was Victoria, British Columbia? England’s first licensed female driver of a double-decker bus was Phyllis Thompson in 1941. The buses’ external appearance was updated again in 2012. This new look pays tribute to the Routemaster design but also includes handicap accessibility and green technology. Landsea’s Whistler & Shannon Falls Tour made the list! Adventure. Excitement. Pure romance with nature. Travelers continuously lust for the thrill of a lifetime with each holiday they take. River rapids, exotic flavors, sensational views, and thrill of living on the edge make exploring new destinations a forever action, thriving off of new destinations and experiences.The team of brave travel experts who comprise Flight Network have sought high and low to bring you winter experiences that check all of the boxes: daring activities, thrilling motions, and stunning landscapes, all from the wonders and beauties of Canada. Our Top 50 Signature Winter Experiences in Canada from 2017 deserved an upgrade with even more magical travel encounters for 2018. On February 27, 2017, Landsea Tours & Adventures is participating in the SPCA National Cupcake Day. We will be making cupcakes for people by donation and all proceeds will go to the SPCA. So in preparation of National Cupcake Day, we’ve compiled this list of 10 GIFs explaining some of life’s feelings. 1. When you are frustrated that your cupcakes didn’t turn out. 2. When you’re in awe of how pretty it is when it starts to snow outside. 3. When life keeps going in circles and doesn’t stop. 4. When you are able to enjoy the little things in life. 5. When you check the last thing off your to do list. 6. When something turns out perfectly. 7. When you fill in the missing pieces. 8. When you have something to celebrate. 9. When you are ready to go out dancing. 10. When you’ve had too much sugar from all those cupcakes.